Serious shooters fire off a serious amount of ammo. 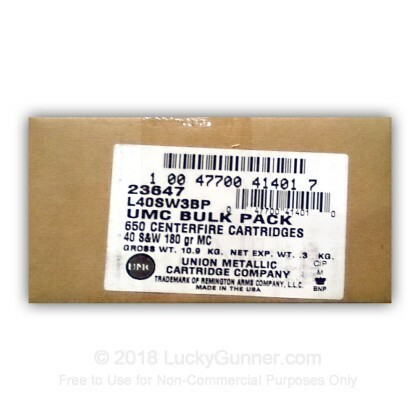 Remington is now packaging their 40 Smith & Wesson MC ammunition in a loose packed 650 round case for those serious shooters who like to keep their skills finely tuned and enjoy the bulk price discount. In 1816 Eliphalet Remington produced his own rifle in his smithing shop which was superior to commercially available rifles of the day. Ever since then, Remington has been leading the charge in technological innovation bringing superior products to the market. Better than Winchesters. Wish I found these much sooner. Will purchase from Lucky Gunner again. Will purchase this ammo again! Just fired 100 rounds in my Sig P250. Everything is great with this ammo as range ammo other than it's a bit dirty. I noticed dirt on my hands when loading the magazines. I also found the gun to need a thorough cleaning after the range practice. I had previously fired Winchester 165 Grain FMJ. This ammo seemed to shoot identically. Overall, you can't go wrong with this ammo on the range. Received quickly. No misfires. Ammo is clean and dependable.